Ultrasonics is steadily replacing radiography for pipeline girth-weld inspections around the world because it is safer, faster, and provides better detection and sizing for Engineering Critical Assessment (ECA) purposes. Furthermore, ultrasonics can act as process control to reduce the reject rate. The key issues for pipeline girth-weld inspections are inspection time, analysis time, inspection reliability (that is, the probability of detection for defects), and more recently, accurate defect depth measurements. This paper describes the development and capabilities of a commercial phased-array mechanized UT girth-weld inspection system. Initially, phased arrays were set up to reproduce conventional mechanized UT scans. This was demonstrated by comparing calibration scans from phased arrays and conventional UT using the same calibration block. The results showed very few differences. Blind scans on several 42-inch welds showed that phased arrays detected all the defects known to be present. Subsequently, the phased-array system was demonstrated on land on a Canadian pipeline. Newer developments include an automated setup procedure and customized setups for specific applications. Pipelines are made by welding together long sections of tubing; then, they are inspected, coated, and buried. Typically gas pipelines are made of thin-wall, high-strength steel tubes to minimize costs. Knowing weld defect depths and locations is critical for establishing structural integrity. In the past, radiography has been the inspection technique of choice, but recently there has been a major shift to mechanized ultrasonics (often called Mech UT or sometimes AUT) . Ultrasonics has exhibited better defect detection capabilities, better sizing, and greater reliability than radiography . Newer inspection codes permit the use of ECA (also known as Fracture Mechanics or Fitness for Service/Purpose), which depends heavily on the accurate determination of defect depths (see 3.0 Codes). 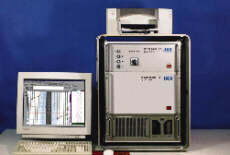 The application of mechanized UT resulted in specific developments: probe pan, zone discrimination, custom calibration blocks, and output displays. 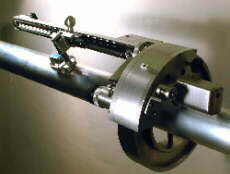 Conventional mechanized UT performs inspections of large diameter pipes in a few minutes, using large probe pans with twenty or more transducers. The scanners perform a linear scan only, with no back and forth scanning movement; thus saving time. Each transducer is focused on a specific section of the weld and oriented to specifically detect certain defects, particularly lack of fusion. The probe pan is mounted on the welding band, which has a position accuracy of ±0.5 mm accuracy. As the probe pan sweeps around the weld, each transducer inspects its particular portion of the weld. This is called zone discrimination. The zone discrimination approach requires specific calibration blocks, with several notches and flat-bottom holes for each zone, plus a through-wall hole for setting gates (see Figure 1). These complex blocks must be cut from actual production pipe due to potential velocity variations . The output display has been custom-designed to assist the operator in making rapid detection and sizing assessments and quick accept/reject decisions. The output consists of a series of strip charts typically arranged so that the weld in effect is spread out from the middle. 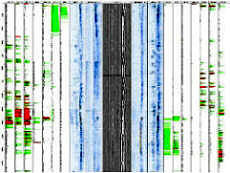 Each strip chart represents one ultrasonic channel, whether in pulse-echo or in tandem mode. Each channel uses two gates; one gate displays the amplitude and the other the time-of-flight. Under normal calibration procedures , the response from each notch is set at 80% full screen height on each channel, and the recording threshold at 40%. Any signal above this amplitude causes a color change on the screen to alert the operator. That way, the operator can check the length, depth (number of zones), and location of the defect very rapidly. Time-of-flight diffraction (TOFD) channels, B-scan maps of the root and cap, couplant channels, and circumferential position indicators are included. While conventional mechanized UT has shown major advantages over radiography (it is faster, presents no radiation hazards, offers better defect detection and sizing, and process control), it still has major limitations. These include large and heavy probe pans, slow setups, limited dimensional flexibility, difficult to interpret images; poor sizing capability under some conditions, no compensation for wall thickness or velocity variations. Despite these limitations, conventional mechanized UT has significantly reduced the reject rate of pipeline welds because of the better process control, thus saving construction costs. Ultrasonic phased arrays have been adapted to girth-weld inspections specifically to address these limitations of conventional mechanized UT (see note # 7). Until 1998, only company specifications were available for performing girth-weld inspections, for example those from NOVA or TransCanada Pipelines Ltd. In 1998, ASTM released ASTM E-1961 (see note # 4), which is a generalized version of the TCPL specifications. E-1961 specifies zone discrimination, output displays, and customized calibration blocks as described above. E-1961 also supports the use of ECA, which permits larger defects (and hence lower reject rates). In 1999, API released an updated version of API 1104, which included mechanized UT for girth welds . The API code is not as specific as the ASTM code, but the two can be used in conjunction. Phased arrays, unlike conventional ultrasonics, generate and receive ultrasounds electronically. An array of elements, each connected to a separate pulser and time delay genarator, is pulsed using a focal law. This focal law defines which elements are to be pulsed, with what time delay. By adjusting the time delays using the setup wizard, the inspector can generate normal beams, angled beams, focused or unfocused beams, shear waves or longitudinal waves, depending on the array, wedge, and other parameters. The ultrasonics can be electronically fine-tuned to optimize inspections. Electronic scans and complex scan patterns can be programmed. For example, by simply multiplexing the start of the scan, the system can perform linear scanning. Sectorial (azimuthal) scans with varying incident angles can be performed by sequentially incrementing the beam through a range of angles. The dynamic depth focusing (DDF) option performs continuous focusing during the inspection of large components. Focal laws can be added to build up complex scan patterns. The focal law also defines the receiver parameters and time delays, which can be different from the pulser focal laws . Different arrays are used for different applications. Most applications use linear arrays, which permit linear scanning, lateral scanning with an angled wedge, and sectorial scanning. In addition to the capabilities of linear arrays, matrix arrays permit sectorial scanning in two directions, such as full phasing capability. There are two common types of circular arrays: 1D annular and 2D sectorial. These types of arrays are primarily used for normal beam inspections, such as for billets and forgings. The 1D array only permits focusing at different depths, while the 2D array permits limited beam steering as well. Electronic scanning, whether linear, sectorial, or DDF, is considerably faster than mechanical scanning. This gives phased arrays a major advantage in speed, as well as reliability. Beam steering offers possibilities that conventional ultrasonics cannot match in cases such as weld and/or complex component inspections. Arrays can be small, which is an advantage where a small footprint is required. DDF allows the operator to inspect with one array a component that would normally require multiple focused transducers. The limitations of phased arrays are known: first, it is a new technology; second, the technology can be complex to setup; and third, phased-array systems are inherently expensive due to the large number of channels, though competing conventional ultrasonic systems are often offered at a similar price. Overall, phased arrays can typically perform the same inspection, or better, than conventional ultrasonics, and sometimes at a lower cost. Savings can come from a reduction in the number of transducers, a reduction in mechanical complexity, and elimination of one scanning axis. In view of the major efforts to establish mechanized UT as the optimum inspection technique for girth welds, any new system must be able to reproduce the current UT inspection techniques, and then show improvements. R/D Tech has modified the conventional PipeWIZARD system to produce a phased array version called the PipeWIZARD PA .
First, the probe pan was significantly shrunk and lightened. The phased-array system required only two 7.5-MHz, 60-element linear arrays to replace over 20 conventional transducers. 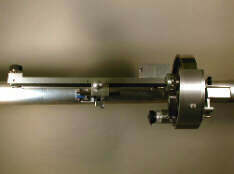 Two removable modules for extra transducers were included to allow for very thick pipes, or for transverse defects. Second, the instrumentation was upgraded to perform phased-array ultrasonics, which involved installing the standard Tomoscan FOCUS time-delay board. Third, the umbilical cable was changed to carry 128 small ultrasonic cables, as well as the water line, power for the motor, and the encoder cable. The TomoView software can handle both conventional ultrasonics and phased arrays, so no software development was required, though girth-weld inspections required some application development. One advantage of the new probe pan and arrays is that the same probe pan and array can be used for pipes from 4 to 56 inches in diameter. In practice, it may be necessary to change the wedge and welding band; but once a setup is loaded, the operator is ready to calibrate, fine-tune if needed, and scan. Figure 2 shows the downsized phased-array probe pan for mechanized scanning (without additional modules). The probe pan typically runs on the welding band. Mechanized scanning is more appropriate for larger pipes and for higher volume inspections. Figure 3 shows the instrumentation, which is built into a truck for on land use. For offshore use, the instrumentation can be 100 meters or more away from the inspection site, which requires extra cabling. 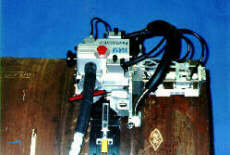 Figure 4 shows a manual scanner for the ultrasonic inspection of pipe welds. This scanner is more suitable for smaller pipes, or low volume inspections like tie-ins and repairs, and runs off its own band. A minimal, portable system consists of a laptop, FOCUS phased-array unit, and the manual scanner. Initially, calibration scans were performed with both conventional and phased-array systems. Figure 5 shows the two calibration scans; it is immediately apparent that the conventional system has a much longer scan time than the phased arrays due to the longer probe pan. The phased array-system saves over six seconds per scan, which can be important for offshore applications. The phased-array scan has wider FBH profiles than the conventional scans, and detects the center-drilled hole better. Otherwise, there are few differences between the two approaches, and both calibrations would be acceptable by ASTM E-1961 or API 1104. Figure 6 shows a typical scan of a test weld, performed blind in this instance. These welds have been previously radiographed in the laboratory, and the results were compared. 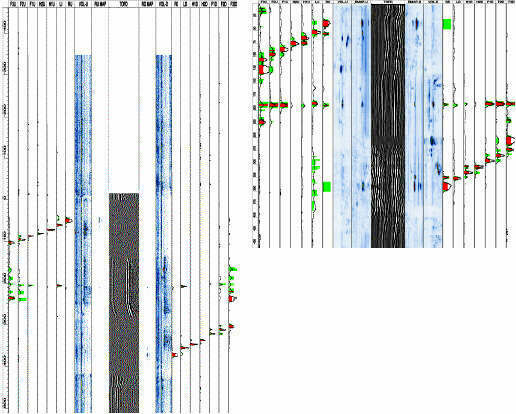 Phased arrays detected all the known defects, and correctly identified them. As radiography cannot measure defect depths, there was no sizing comparison, though the arrays could easily size the defects. Phased arrays offer significant new inspection approaches due to the practical limitations of conventional mechanized UT. With conventional mechanized UT, each new weld profile, changes in wall thickness or other parameters require time-consuming repositioning of the transducers in the probe pan. With phased arrays, entering weld parameters into the weld profile template automatically generates the focal laws required to inspect that particular weld. This only takes a few seconds, and the operator is ready to calibrate and perhaps fine-tune the setup. Typical weld profile inspection plans are shown in Figure 7. Since phased arrays don't have the physical size restrictions of conventional mechanized UT transducers and wedges, they can perform more complex inspections than conventional mechanized UT. For example, for the 15-mm wall weld shown in Figure 8, conventional mechanized UT would be physically limited to, say, eight zones. With phased arrays, the number of zones has been quadrupled to 32. This inherently gives improved detection and sizing. Fig 8a: Fig 8b: Fig 9: Phased-array scan of a 15-mm manual weld calibration block with 32 zones. Phased arrays can reproduce conventional mechanized UT scans, and bring about significant improvements. Loading a prepared setup file permits the operator to rapidly scan any weld profile. Setup files can be automatically prepared by entering weld parameters into the weld profile template. Pipes from 4 to 56 inches in diameter can be inspected using the same array; only the setup and the wedge need to be replaced. Phased arrays permit much more complex scans than conventional mechanized UT, e.g. increased number of zones, extra inspections, multiangle TOFD. The increased number of zones brings better imaging and sizing. Phased arrays are now commercially available to perform mechanized UT of pipeline girth welds. The application was funded by PRCI, project PR-270-9813. H. Heckhäuser and S. Schultz, "Advanced Technology in Automated Ultrasonic Weld Inspection of Pipeline Girth Welds", Insight, vol 37, no 6, June 1995, p. 440. J.A. de Raad and F.H. Dijkstra, "Mechanized Ultrasonic Testing on Girth Welds During Pipeline Construction", Materials Evaluation, August 1997, p. 890. N. Dubé, E.A. Ginzel, and M.D.C. Moles, "Customized Ultrasonic Systems for Gas Pipeline Girth Weld Inspections", International Pipeline Conference, Calgary, Alberta, Canada June 7-11, 1998, ASME Paper No. IPC-98-162. B. Gross, J. O'Beirne, and B. Delanty, "Comparison of Radiographic and Ultrasonic Inspection Methods on Mechanized Girth Welds", Pipeline Technology Conference, Oostende, Belgium, 15-18 October 1990, #14.17. E.A. Ginzel and R.K. Ginzel, "Study of Acoustic Velocity Variations in Line Pipe Steel", Materials Evaluation, May 1995, pp. 598-603. ASTM E 1961-98, Standard Practice for "Mechanized Ultrasonic Examination of Girth Welds Using Zonal Discrimination with Focused Search Units", September 1998. American Petroleum Institute, "Welding of Pipelines and Related Facilities", API Standard 1104, Nineteenth Edition, September 1999. R/D Tech, Tomoscan FOCUS Ultrasonic Phased Array System Spec Sheet, http://www.rd-tech.com . M.D.C. Moles, E.A. GinzeL, and N. Dubé, "PipeWIZARD-PA - Mechanized Inspection of Girth Welds Using Ultrasonic Phased Arrays", International Conference on Advances in Welding Technology '99, Galveston, Texas, October 26-28, 1999, sponsored by EWI and AWS. B. Gross, T. S. Connelly, H. van Dijk, and A. Gilroy-Scott, "Flaw Sizing Using Mechanized Ultrasonic Inspection on Pipeline Girth Welds", ICAWT '99, Galveston, October 26-28, 1999. Also see "Update on the Alliance Pipeline" at the same session.